What happens to rock layers under a diagonal pull, or being pulled apart? As can be seen during recent years, this has resulted in derailing trains, sinkholes suddenly appearing, gas and water main breaks, torn roadways and separating bridges. Despite the effect on man, crawling about on the surface of what they assume to be terra firma, these changes are superficial. When the pulling starts, weak points break and thereafter the plumbing and roadways hold, giving the impression that the pulling has stopped, but this is misleading. The North American continent is giving evidence that its rock layers are separating from each other, and sliding sideways in a diagonal, thus exposing portions of these layers to vent into the air above. If rock is being stressed, then where are the earthquake predictors giving evidence of this, the frantic animals, the static on the radio, the earthquake swarms? Rock in the stretch zone, pulling apart rather than compressing, does not emit the particles flows that animals and radios sense, nor register on instruments are tension and release quakes. "We have repeatedly stated that the Earth changes will not diminish, but will increase going into the pole shift. This is not a lineal matter, as the closer Planet X comes to Earth, an inevitable path, the more the torque effect and the polar wobble where the N Pole of Earth is pushed away violently on a daily basis, occur. The wobble will become more pronounced, more violent. The plates are tugged back West of the Atlantic, pulled forward East of the Atlantic, during the daily rotation of the Earth. The North American continent is allowed to roll East during rotation while the S Pole is pulled West, creating the diagonal pull likely to trigger the New Madrid fault line into an adjustment, and soon. The N Pole is pushed away and allowed to bounce back, daily, as the Earth rotates, a wobble that puts stress on all fault lines when the plates are suddenly in motion, and suddenly stopped! "As there is no other explanation for the effect on the stretch zone, lacking any earthquakes to blame, and as these stretch zone accidents will continue to emerge, and with ferocity, this is a certain clue to those on the fence, that the influence of Planet X is the cause. Or is it Global Warming?" "Sinkholes almost invariably form in areas subject to karst limestone cavern formation. Underground water flows eat away the limestone leaving vast caverns and caves, which often give scant indication above ground that a cavern lies below. Karst limestone rock formations have been mapped and are known, however, but since one never knows just where a cavern might have formed, this provides little help in predicting just where a sinkhole might form. Sinkholes open up when the rock is fractured due to stress from being in the stretch zone, from the bending of a plate, or due to torsion." Heavy rain washed away part of a major Gwinnett County roadway early Friday morning, and authorities plan to keep it closed through the weekend. A sinkhole developed on Scenic Highway, forcing the closure of a northbound right turn lane onto Henry Clower Boulevard, the Georgia Department of Transportation said in a news release. The lane has been blocked all day. On Friday Benton Harbor Mayor Marcus Muhammad posted these photos to Facebook that show a bus that fell into a sinkhole. This occurred between 3:30 PM and 3:45 PM on Highland Ave. near Nowlen Street. Muhammad wrote, "The Bus that was caught in the sink hole was towed away. Thank God there was no injuries. The cause of the sink hole was that a water main broke under the road which weakened the street and caused it to collapse. Emergency funds from the City Income Tax will be used to repair the damage. The street is blocked off and staff is working to restore water for residents impacted by this circumstance. "This afternoon, a First Student bus transporting Berrien RESA students to their homes in Benton Harbor was involved in a minor accident. While in route, the rear tires of the bus fell into a sinkhole. No one was injured during the incident. As always, student safety is our number one priority. Thank you to First Student's transportation personnel and local emergency officials for supporting our students during this situation." ST LOUIS, Mo. - The city's streets department said they have covered up a hole in the street near the intersection of Potomac and Illinois in south St. Louis after part of a school bus slid into it. The incident happened on Wednesday morning. A resident who lives in the area caught the incident on surveillance footage. The Metropolitan Sewer District said staff will be coming out to the area on Friday to get a look underneath the hole. Nobody was injured in the incident and the bus was able to pull out of the hole without having to be towed. 'The (engineers) basically said that somebody's going to die,' says Sechelt District spokeswoman Julie Rogers.Fourteen homes in a Sechelt neighbourhood plagued by sinkholes have been placed on evacuation alert by the district. A new engineering study received by the District of Sechelt this week concluded homes in the Seawatch neighbourhood near a massive new sinkhole are not safe to occupy. Geotechnical instability has resulted in multiple sinkholes in the area of North Gale Avenue and Seawatch Lane, with “the potential of danger to life and health,” the warning reads. Residents have been told to get packed and be ready to go. “The (engineers) basically said that somebody’s going to die,” said district spokeswoman Julie Rogers. A 25-metre deep sinkhole opened up without warning on or around Boxing Day that was “big enough to swallow a car.” After a drilling investigation, Thurber Engineering recommended that the district should not allow occupancy of the residences in the area. Residents said they were told Thursday evening that an order to evacuate could come as early as Friday afternoon. Once that order is enacted, residents who leave their homes will not be allowed to return to their homes until the order is lifted, said homeowner Rod Goy. Neighbours are concerned that once they leave, they may never be allowed to return to their homes, he said. “We are sitting on pins and needles right now waiting for the other shoe to drop,” said Goy. Much of the Seawatch area has been closed to vehicle traffic for months because of the subsidence of the roadbeds, leaving homeowners to walk to their homes past large concrete barriers. The instability of the area has left homeowners with houses that cannot be sold and that could soon be uninhabitable. One home has already been condemned after a sinkhole opened up under the foundation of the home, leaving the Storey family paying a mortgage on a home they aren’t allowed to enter. Rod and Donna Goy’s home is not damaged, but they are surrounded by craters, failing roads and broken sewers. Storey’s efforts to seek compensation have so far failed. After mediation failed, the Storeys filed suit against the District of Sechelt, the developer Concordia Seawatch, 14 engineering firms, home insurer Travelers Guarantee and five real estate agents, among others. Greg and Gerry Latham’s $1-million home is just a few metres from a sinkhole that opened up in 2012, swallowing a car. “We had an independent appraisal done, but due to the special circumstances they said our house is now worth zero,” said Greg. The Lathams dropped out of the lawsuit after it became clear they could not hope to recover their loss, because their house is so far undamaged. An earlier assessment by Thurber Engineering noted that wet zones, spontaneous springs and sinkholes developed during site preparation for building in 2008. “These issues were ongoing throughout construction and are documented in the available geotechnical information,” the report said. Engineering studies of the area dating back to 1988 noted the potential for soil instability, but generally concluded the site could be used for dwellings. The district has filed suit against Concordia to recover $500,000 in municipal repair costs. In approving the development, the district entered into a covenant in 2008 with Concordia stating the “Municipality has no specific knowledge and makes no representations or warranties regarding the geotechnical adequacy of the lands for the proposed uses,” according to the District’s notice of civil claim. Concordia has built and sold 15 homes in Seawatch and holds 14 more empty lots and one empty home that may never be occupied. A huge 30ft-wide and 19ft (6metre) deep sinkhole has opened up in a field, starting a hurried investigation by the Coal Authority. 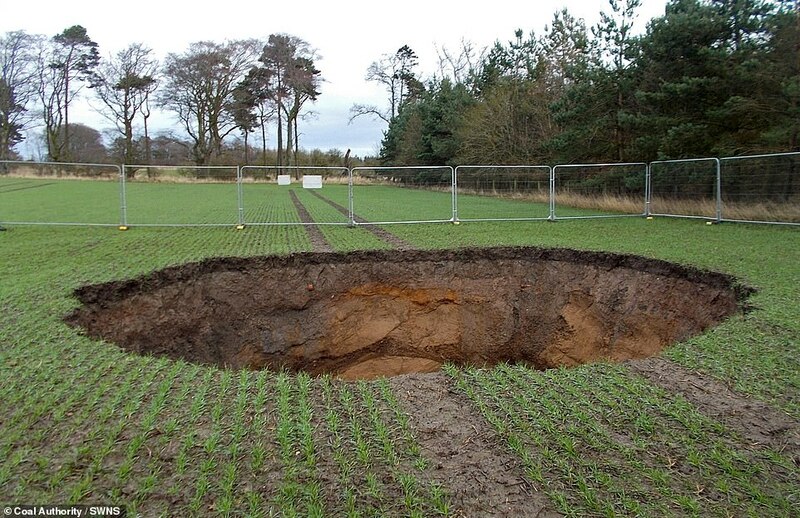 The public safety and subsidence team at the Coal Authority were alerted to the massive hole, in a field in Midlothian, Scotland, after the landowner spotted it on Friday. Coal Authority bosses have already sealed the area off and will visit the site in the coming weeks to inspect the hole. James Hammond, regional project manager for the public safety and subsidence team at the Coal Authority, said: 'In December 2018, we received a report of a hole in a field in North Midlothian. 'Our regional team responded quickly to erect fencing to secure the area. 'We will be undertaking thorough investigations to determine the cause of this incident. A new sinkhole has appeared on property near Seawatch Lane, in close proximity to other sinkholes that have formed previously, including one in September. Another sinkhole has formed at Sechelt’s Seawatch neighbourhood and is within throwing distance from a cluster of sinkholes that developed previously, including one in September. The new sinkhole is located on vacant property, owned by developer Concordia, on the 6600 block of Seawatch Lane and measures approximately six metres (20 feet) wide with a cavernous interior and a depth of approximately six metres. An excavator was on scene the morning of Dec. 27 to fill in the hole with rocks. The road remains open. First responders have been made aware of the sinkhole, according to Rob Michael, interim emergency program coordinator for the Sunshine Coast. He was notified on Boxing Day. “At this point in time, first responders have been pre-notified in case the situation worsens,” he said. “Currently the situation is well in hand with District of Sechelt staff, including an overnight watch in the area,” said Michael in an email. He also said Emergency Management BC and nearby residents have been alerted. That did not include Elliott Held of Gale Avenue North, who lives downhill from the sinkhole and next to a condemned home from which residents were forced to leave after a sinkhole formed on the property. Held said he was notified on Dec. 24 by another resident, but as of Dec. 27 he had not been contacted by the District of Sechelt or the developer. The sinkholes are the product of geotechnical issues that began appearing in 2012, and that have required the district to close off sections of the road, resulted in a denial of occupancy permit for a nearby home, and forced a family to leave after their home was condemned. The debacle has also led to lawsuits against the developer and the District of Sechelt and a separate lawsuit between the district and the developer. SCDOT: Drain pipe collapse causes large sink hole to open up at gas station off Haywood Rd. Greenville, SC (FOX Carolina) - Greenville police said Haywood Road was closed at Airport Road heading toward Laurens Road Friday morning after an SUV-sized sinkhole opened at the entrance to the Kangaroo gas station. Josh Rowe, a maintenance engineer with the SCDOT, said he was called out about 7:30 a.m.
Rowe said a drain pipe collapse caused the sinkhole to open. He said the dirt surrounding the pipe likely washed away, causing the pipe to collapse under the weight of the concrete surface above it. The drain pipe was on gas station property and the DOT believes it will be the gas station's responsibility to repair. The damage is not affected the road. Rowe said the damage starts at the sidewalk and then back onto the gas station property. Rowe said crews inspected the road and determined it was structurally sound, but the lane closest to the hole on Haywood Road will be closed until the hole is fixed. Greenville, SC (FOX Carolina) - Thursday morning some employees of a local business arrived to work to discover a massive surprise. Central Freight lines, a trucking company that services the Greenville, Spartanburg area, is currently trying to figure out what to do for their deliveries after a sinkhole opened trapping their shipping trucks in their property. We're told that no one was hurt and employees can come and go, but because of where they park their shipping trucks, they have no way to access that part of the property to resume business as usual. The Gannt Fire Department was on scene and confirmed to our crew that a creek that flows under a bridge on the property has had flooding issues in the past. Because the sinkhole happened on private property, we're told it will be the businesses responsibility to fix it.